Since Healthy 'N Fit originated 100% EGG PROTEIN no one has introduced a higher quality, more effective muscle building protein. Healthy 'N Fit 100% EGG PROTEIN has a higher P.E.R. 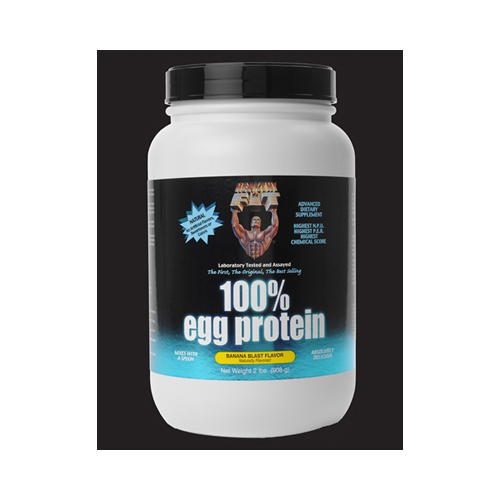 (Protein Efficiency Ration) than any other protein available, anywhere; Healthy 'N Fit 100% EGG PROTEIN has a higher N.P.U. (Net Protein Utilization) than any other protein available, anywhere. *FACT - Healthy 'N Fit pioneered and developed the first 100% EGG PROTEIN over 30 years ago. Since then we have been the leader in egg protein technologies. Our product contains 100% egg white proteins and peptide bond amino acids, as well as the natural enzymes Papain and Bromelain. *FACT - Healthy 'N Fit was the first company to introduce an all natural egg protein to the market. Our product is free from artificial flavors, sweeteners, colors and preservatives. The chickens our eggs come from are not given hormones (in compliance with USDA regulations for all eggs). This product contains no added sugars, sugar alcohols, fats, salt, milk protein, gums, fillers, gluten or wheat ingredients. All the amino acids in this product are natural. *FACT - The Protein Efficiency Ratio (P.E.R.) and Net Protein Utilization (N.P.U.) are both renowned and proven scientific methods for rating the quality of a protein and how well the human body can utilize that protein. No other product available has a higher P.E.R. (3.9 or greater) or N.P.U. (94%) than Healthy 'N Fit's 100% EGG PROTEIN. *FACT - A protein's Chemical Score is based on the amino acid profile. Egg protein is considered a nearly perfect source of protein because its amino acid profile most closely matches that needed by the human body. Therefore, egg protein has been given a rating of 100 in the chemical score. Below is a comparison of the chemical score of some other proteins. MEAT PROTEIN - 69% *FACT - THE MOST LOGICAL CHOICE FOR BUILDING AND MAINTAINING LEAN MUSCLE MASS...HEALTHY 'N FIT 100% EGG PROTEIN. THIS STATEMENT IS NOT BASED ON BIASED OPINION BUT... *FACT * These statements have not been evaluated by the Food and Drug Administration. These products are not intended to diagnose, treat, cure or prevent any disease. Information such as specifications, ingredients, nutritional information, pricing, and availability, etc. are subject to change at any time without notice. Please refer to the actual label of the product for the most accurate information. As a reminder, it is always recommended to check with your health care provider before taking any dietary supplements or making any major changes to your diet or exercise program. Be sure to read the entire product label before taking any product. The information provided on this site is for informational purposes only and is not intended as a substitute for advise from your physician or other health care professional or any information contained on or in any product label or packaging. These products are designed to be used in combination with a healthy diet and exercise program. 100% Pure Extracted Egg Albumen (with a Protein Efficiency Ratio (P.E.R.) of 3.9 or greater), Enzymatic Digest of Egg Albumen containing naturally occurring Amino Acids, Natural Flavors, Stevia Herb Extract, Papain and Bromelain (natural digestive enzymes), Soy Lecithin. CONTAINS: EGG AND SOY (LECITHIN). Soy lecithin helps to naturally instantize the product.